good in humanity. Figurine stands 5.5" tall - and comes in a gift box. Makes a perfect gift for any occasion. 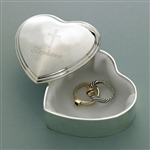 This silver plated Inspirational Heart Trinket Box with Engraved Cross is the perfect place for her to keep her precious mementos. An excellent keepsake gift, she'll be reminded of her faith whether displayed on the vanity, dressing table, or nightstand. Measures 3" x 3" x 1 1/4". Personalize with one line of up to 15 characters. Keep your treasures safe and sound with this attractive silver-toned keepsake box, just big enough for your beloved photos, artifacts, jewelry, or any other items that are near and dear to your heart. Lid includes a place for your favorite snapshot and enough room for engraving names and a date. A great personalized gift for bridesmaids, groomsmen, bride and groom, Mom, Dad, son or daughter - for any graduations, weddings, Mother's Day, Father's Day - or any other special occasion. Measures 6 1/2" x 5" x 3 1/8". Glass measures 4 1/8" x 2 3/4" and holds a 3 1/2" x 5" picture. Personalize with two lines up to 25 characters per line. 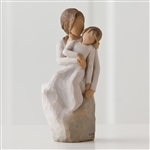 This beautiful Demdaco Willow Tree figurine depicts the special bond shared between a mother and daughter. Each Willow Tree figurine is cast in resin from original, hand-carved sculptures by artist Susan Lordi, then individually painted by hand. These beautiful sculptures speak to our spirit and embrace all that is good in humanity. Figurine stands 6" tall - and comes in a gift box. Makes a perfect gift for any occasion. This beautiful Demdaco Willow Tree figurine depicts the special bond shared between a mother and son. 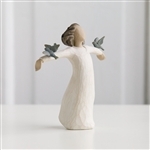 Each Willow Tree figurine is cast in resin from original, hand-carved sculptures by artist Susan Lordi, then individually painted by hand. These beautiful sculptures speak to our spirit and embrace all that is good in humanity. Figurine stands 8" tall - and comes in a gift box. Makes a perfect gift for any occasion.